This simple dish, melanzane fritte al pomodoro, tastes surprisingly rich and complex, and the results are so versatile: You can use it as a pasta sauce, as a side dish to a meaty main, or eat it spread on slices of hearty, crusty bread. It can be served at room temperature as well, as a dip or side dish, so it's a great dish to bring along on a picnic, served on crostini as a party finger-food, or to bring to a potluck. It also just happens to be both vegetarian and vegan, so it's accessible to many diets and lifestyles. If you have an abundance of eggplant to use up, you could make a big batch of this and can or freeze the excess so you can continue to enjoy summer's bounty during the colder months. There is a very similar dish in Turkey, quite popular during the summer months, called patlıcan kızartma or patlıcan kızartması, which is served in either a simple tomato sauce, like the one shown here, or with a garlic-yogurt sauce (or sometimes both). After you have trimmed and sliced the eggplant, heat the frying oil in a heavy-bottomed pot or high-sided skillet. Fry the slices in batches, to avoid crowding, until golden brown on both sides, turning occasionally with tongs or wooden chopsticks to help them brown evenly. As the eggplant slices are done, remove them with a slotted spoon or wire-mesh skimmer to drain on a ​paper-towel lined plate. Heat the extra-virgin olive oil and minced garlic in a medium saucepan over medium heat, just until fragrant and starting to color, but not browned, about 1 minute. Add the diced fresh tomatoes (or slightly pureed canned diced tomatoes), the sugar, and season with salt and freshly ground black pepper to taste. Cover, lower the heat to low, and simmer for about 20 minutes, or until the tomatoes have broken down and the sauce is flavorful and a bit thickened. If the sauce seems too watery, you can add some tomato paste (doppio concentrato di pomodoro) as needed, and/or continue cooking it down a bit. 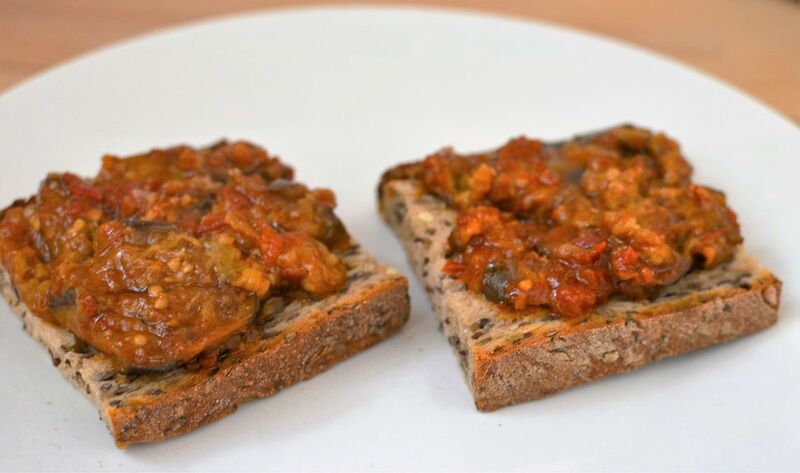 Depending on how you will be using the eggplant, you can either serve the fried slices on a plate topped with the tomato sauce or mix them together to form a spread, dip or pasta sauce.